Last week I talked about how we lived on one income for almost fifteen years, and how we made it work. How we survived on one income. I also mentioned that we’re working to become debt-free. Sometimes, in order to get out of debt (or just to make ends meet), you have to go beyond simply saving money. You need to make more. If you read through my list, you can see that we’ve tried to live as frugally as possible, without a lot of extras. But it hasn’t been enough for us. At one point, we came to the realization that we needed to increase our income. But how? 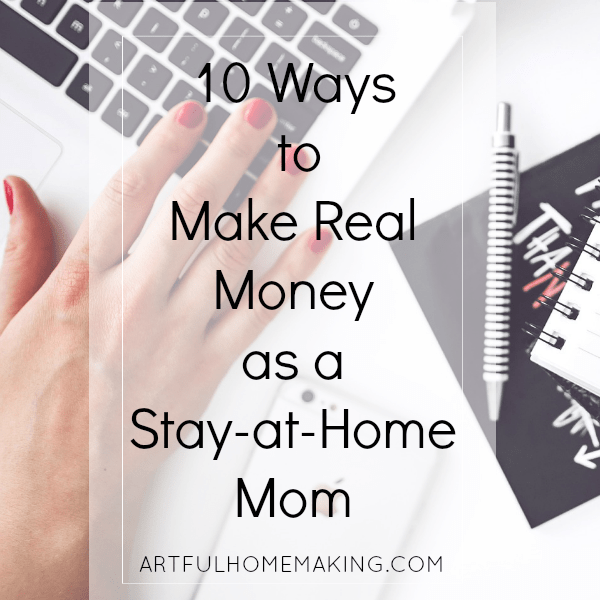 We’re committed to homeschooling and I’m very committed to being a stay-at-home mom. Our situation led to lots of late-night brainstorming sessions about how to make more money while staying home with our kids. Here are some of the ideas we’ve come up with. I haven’t tried all of them, but the ones I’ve tried have been successful for me (in varying degrees). I know quite a few moms who have brought in a good income through offering childcare in their homes. This allows them to stay home with their own children while earning income at the same time. If you like to write, this is something you can do from home to earn money. Check out this website if this is something you’re interested in. I know several stay-at-home moms who are virtual assistants. A virtual assistant is a self-employed administrative or personal assistant who provides various services to businesses. This is something I’ve considered doing for years, but I just can’t seem to get it going. I even have a half-opened Etsy shop! So many moms are making an income from selling on Etsy. You can either make your own goods to sell or sell vintage items or craft supplies. One idea I haven’t seriously considered is taking care of other people’s animals. I love animals, but I don’t think it’s a job I would enjoy (even though my kids would love it!). 🙂 However, I have heard of people making a full-time income doing this! My husband and I have been selling on eBay for years (we’re now PowerSellers! ), so I know it’s a legitimate way to make money. Usually we just sell items we no longer need, although there have been a few times that we found new items at a very inexpensive price and made a good profit on them. Selling on eBay is pretty easy but it can be time-consuming. If you’re a homeschool mom, you probably have lots of books sitting around! I always try to take good care of our school books so they can be sold at the end of the year if they won’t be used for another child. This won’t bring in a regular income, but it’s a good way to make enough money to cover school books for a new school year. I’ve sold books on Half.com, eBay, and Homeschool Classifieds. After our first baby was born, I did medical transcription for awhile to bring in extra income. I had worked in two doctor’s offices and a hospital, so I was familiar with medical terminology. You can actually make a full-time income from home doing medical transcription, but you might have to put in full-time hours to get it, and sometimes this is a hard field to get into. The past several years, most of my income has come from blogging. Almost everyone I know who makes an income from blogging has multiple streams of income, which means it doesn’t all come from one place. Even several smaller “streams” can add up to a substantial income. I’m going to be sharing more about my blogging journey in the days to come, but let me just say here that this blogging course has been a game-changer for me. I wish I had taken it years ago! (The course is closed right now, but it’s worth it to get on the waiting list so you’ll be notified when it reopens. Plus, you can get a free book, 7 Surefire Ways to Boost Your Blog Income Overnight, just for signing up for the waiting list!) Sign up and get your free eBook here. 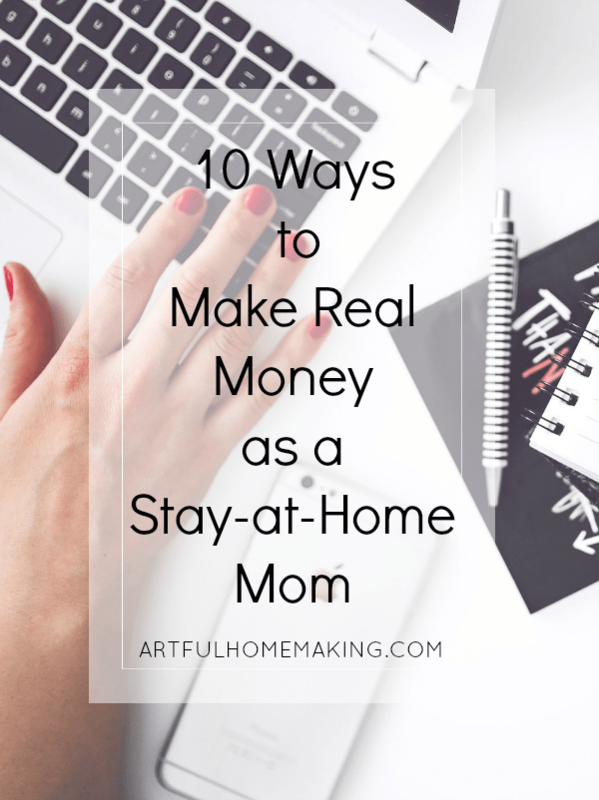 Are you a stay-at-home mom who needs to make money from home? This post contains affiliate links. See my full disclosure here. Sharing here. wow great tips. thank u.
personally im using koocam site to work from home, u definitely gave me more tips and options. What a great list! Thank you! I sell stickers that I make on etsy! I don’t earn a ton (with all the costs involved) but I’m trying. You make money blogging? I Have blogged for years and I Have never made money with my blog. I have considered putting ads on my blog…but then I figured no one would probably click on them and it would take away from the *homey & cozy* feel I try to have on my blog…does that make sense? Yes, some of my income does come from blogging. I’m thinking about doing a post that explains it a bit better, since I’ve received some questions about it. And I do know what you mean about feeling concerned that ads take away from the welcoming feeling. I was concerned about that too, but then I realized that if it’s a blog I really like, I’ll read it anyway even if there are ads. But there are other ways to generate income that would eliminate the ads. Oo, I’ve gotta get my hands on that writing course… someday!